Cooling a large warehouse is expensive. Aero Mist has a wide range of cooling systems that reduce temperature and are energy saving devices that can lower your electrical consumption. Our engineers can custom design an effective misting system with only the highest quality components which will allow you to regulate temperature, humidity and dust in your warehouse, plant or factory to increase profitability. 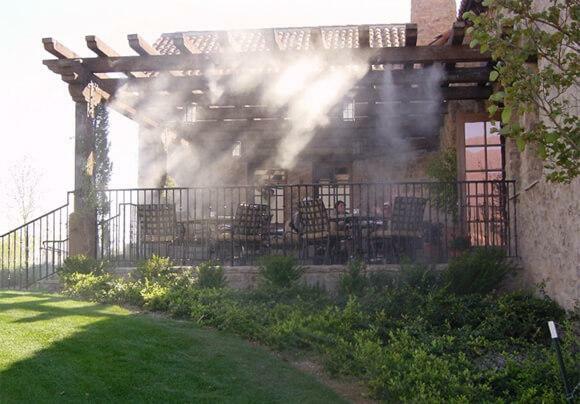 Installing our misting systems will create a more comfortable and controlled environment to keep equipment running at optimum levels. Using an Aero Mist misting system will also help prevent wood products from warping; control evaporation in green houses, wineries, in paper production or textile operations. Properly installed misting systems will also reduce static electricty and possibly a dangerous explosion. Aero Mist industrial misting systems are powered either by a direct drive or pulley 1000 PSI pump that atomizes water into fine droplets down to 10 microns. It is this mist that ‘flash evaporates’ by the surrounding hot air and lowers the ambient temperature in the cooling area by up to 25 degrees F. The pump is connected to an ordinary water supply and pressurizes the water to 1000 PSI before it is forced through the nozzle heads to create the cooling effect.